Now I have a confession to make. Until recently, the only reason I was buying kale was that somehow it made me feel healthier. Kale was my morning run, the responsible, and sometimes boring, part of me; my pretext for eating more of that mocha ice cream. Other than that, I thought Kale tasted bitter. It was OK, but nothing like my favorites: spinach and Swiss chards. And I’m not even talking about Mohammed’s opinion on the subject. The man rolls his eyes every time I reach for that Frizzy looking green at the market. I think that our aversion with Kale had something to do with my lack of confidence and ideas when cooking this intimidating green. My mother often tells me this story about the woman who taught her how to turn any kind of greens into an exciting dish. This woman, her name was Ghazielle, which literally translates to little Gazelle. Ghazielle was by no mean petite. She was 6 feet tall, had strong shoulders, a suntanned face, from working in the fields all her childhood, and beautiful, dark kohl eyes. When she wasn’t looking after my younger brother, Ghazielle would sometimes make fresh bread for us. Bending over the gassa* (a large earth ware where you knead bread and make couscous) she would push and fold the dough back and forth until elastic and smooth. Her bread was, and still is, the best homemade bread I’ve ever had. It’s rustic, imperfect in appearance, humble, chewy and so flavorful. One fine morning, Ghazielle came into the kitchen to find my mother serving Sautéed khobiz with garlic. 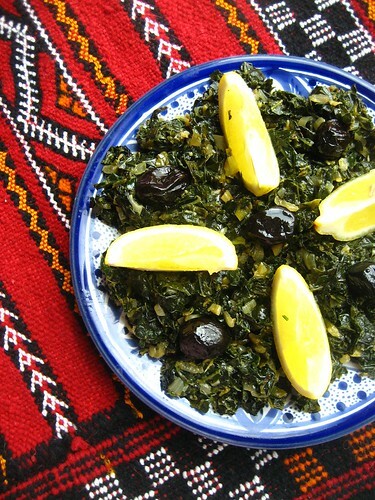 Puzzled by the sad look of the greens, she asked her if this is how she normally serves khobiz, to which my mother says yes. After some giggles from both of them, and a confused and hungry look from us, Ghazielle placed the skillet back on the stove and started sweating some onions, along with spices and herbs, and tossed the greens into the spicy mixture. My mother still recalls how it tasted: moist, earthy, complex yet simple and delicious. 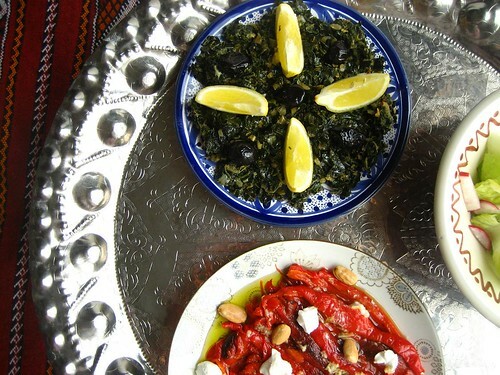 Last weekend, while little angels were napping and tiny tomato plants were being planted, I gave kales a makeover, a Mediterranean meets Algerian makeover, and it was good, surprisingly good. Besides chopping the kale and rinsing it multiple times, the recipe doesn’t take long to put together. Onions are sautéed until happy and translucent, to which you add an herb, garlic and spices mixture. Finely chopped kale are added to mingle with the other ingredients and cooked until silky and tender. Plain yogurt is added at the end to add tanginess and freshness to these greens known for being fairly dry, but bitter and boring they were no more. Strip the kale leaves off their stems and cut away the tough midribs of any large leaves. Chop finely and wash in plenty of water. Drain well. Chop and pound the parsley, coriander, garlic and 1/4 tsp salt to a paste in a mortar or a food processor. Heat a large sauté pan and add olive oil and the chopped onion. Cook until translucent, about 5 minutes. Add the herb paste. Cook 2 minutes stirring and without burning, then add the kale, cumin and smoked paprika, stir to combine, and cover the pan. Cook for 15 minutes, or until the greens are tender. When they are tender, remove the lid and allow any excess water to evaporate. Turn off the heat and stir in the yogurt. Serve with bread, cured black olives, or any of your favorite olives, and wedges of lemon to squeeze to taste. - 1 bouquet de chou frise (500g) ou autre herbe de votre choix comme roquette, épinard...etc. Retirer les tiges du chou frisé et couper les feuilles finement. Laver abondamment dans de l'eau et bien égoutter. Faites chauffer l'huile d'olive dans une poêle. Ajouter l'oignon haché et cuire jusqu'à ce qu'il devienne transparent, environ 5 minutes. Ajouter le mélange d'herbes. Cuire pendant 2 minutes tout en remuant et en évitant de le bruler, puis ajouter le chou frisé, le cumin et la paprika fumée, mélanger puis couvrir la poêle. Cuire pendant 15 minutes, ou jusqu'à ce que le chou frisé soit cuit. Quand ce dernier est cuit et tendre, retirer le couvercle et faite réduire l'excès de liquide. Retirer du feu et ajouter le yaourt tout en remuant. Servir accompagné de pain, d'olives noires et des quartiers de citrons. I love kale .... even though it's good for me ! So I must try it cooked like this , it sounds delicious . coucou !!! enfin une apparition !! et toute en couleurs...C'est frais,c'est léger,c'est de saison. Lovely writing and photos! It is good to have you back! What is that dish with the asparagus on the bottom right corner of the grouping I wonder? Good to see you back at the key board, my friend. - Smit, this is truly my favorite way of cooking kale so far. - J.W, thank you! I'm glad to back as well. I missed being here. 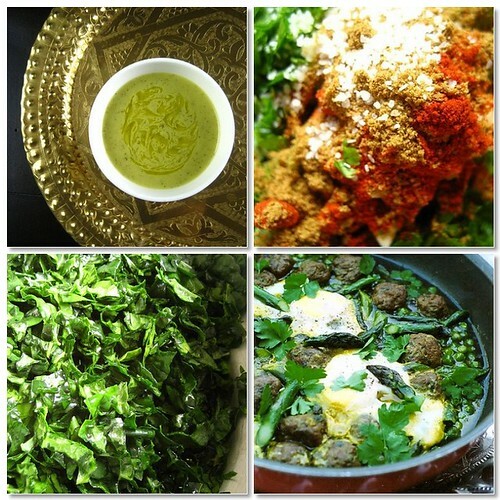 The dish with the asparagus is a tagine with green peas, asparagus, meatballs (Kefta) and poached eggs on top. Really delicious and in season. - Mom, thank you Cindy! It feels good. Hugs. Definately going to try this recipe - I have never been big into kale but apparently it's SUPER healthy so hopefully this gets me hooked. Thanks for this recipe! I've only ever had kale in restaurants and just assumed it was difficult to cook. Hopefully I can make this recipe and not have to eat out to have kale! Ohhhh, please give us the pea and asparagus tagine recipe!! It sounds wonderful. And I agree with Brooke's comment on your Weeknight Potatoes, above. They are special enough for celebration meals. I served them with an Easter-Passover meal I made. Scrumptious! - Cathrine, thank you!It feels good to be back. - We are not Martha, hope you'll like it. - Brooke, you're so sweet! So happy to hear that you and your guests enjoyed the potatoes. Thank you! - Mary, oh please, don't be intimidated. It is very easy to cook and can hardly be messed up. Actually with kale, compared to other greens, I find that cooking it longer makes it even more silky. Give it a try! - Saffron, I'll post about the tagine someday. And thank you for giving my potatoes a try. Thank you for this tasty recipe! I tried it last week with a mix of russian kale and collard greens from our CSA and it was delicious--a whole new set of flavors than I usually use with greens. Hello Warda, I am so happy you are back! I have missed your food stories and beautiful photos. They always make me smile (and hungry). p.s. Can you please post the recipe for S'fendj you talked about last fall? I am definitely going to try this tonight..it looks yummy and delicious. - Cheryl, I'll do my best at posting it soon. Thanks for reminding me about it. - R, thank you for stopping by! - Joydeep, hope you'll like it. That looks delicious. It reminds me of one of my favorite dishes: Bouqoula. Never thought of making Bouqoula with Kale :o) Thanks for sharing! This is my first visit to you blog (I was looking for a Msemmen recipe) :o) Interesting that you don't use yeast. Some people do, and some don't. C'est Sawsen d'Oran, j'ai découvert votre blog récemment, et je dois vous avouer que c'est un vrai régal. Je suis toute émue Bent Bladi tbarkl'Allah 3leik. J'attends impatiemment vos prochaines recettes. Mes amitiés ma chère! Bisous..
- Sawsen, bienvenue! et merci pour ce gentil message. J'espere poster une nouvelle recette tre prochainement... embrasse bien fort Wahran de ma part. I like kale and have been looking for a new preparation. Merci! I keep thinking about learning how to cook (I adore baking and usually want to eat all my calories in cookie and chocolate form). Dinner in our house is usually a side dish. I am also a SE Mich gal. Warda, do you have any local restaurant recommendations? At last kale is in season here again and I can make this tomorrow ! I've been looking forward to it since you posted it . Warda please come back! We know you're so busy with your sweet petites, but we miss you! everything tastes better with lemons. love kale! This sounds wonderful--the photos are beautiful and you always have such a beautiful way of telling the back story, thank you!